PaintCare plans special, one-day paint drop-off events in some parts of Oregon. These events are open to households and businesses (painting contractors, property managers, etc.) in the state. There are places all over Oregon where you can drop off leftover house paint for recycling. In fact, PaintCare processed 810,000 gallons of paint in 2017 alone. 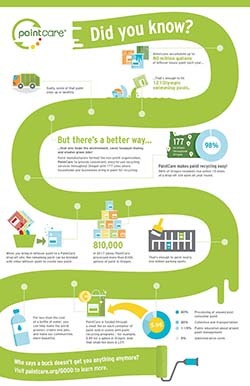 It you’ve ever wondered how the PaintCare Oregon Program works, click the infographic to the left for details. It’s more convenient than ever to recycle paint in Oregon. Since the start of the Oregon paint stewardship program in July 2010, PaintCare has set up 169 drop-off sites in Oregon where the public can take unwanted, leftover paint for recycling year round. Most of these sites are at paint retailers (paint, hardware, and home improvement stores) that have volunteered to take back paint, and they are available to any household and business in Oregon. A few retailers are Habitat for Humanity ReStores. These stores accept paint whenever they are open for business. A number of PaintCare drop-off sites are household hazardous waste programs — either facilities or “round-up events.” These programs are run by the local county or city government agencies, often in partnership with a local garbage and recycling company or transfer station. In addition to accepting paint, these programs usually accept other non-paint hazardous wastes (e.g., pesticides, solvents). Most of these government programs limit participation to the households of certain cities or towns. Some of these government programs also allow businesses to make appointments during during special hours. Businesses are usually charged fees for non-paint hazardous waste, and sometimes they are charged an administrative fee to schedule an appointment, but they are not charged for paint, on a per gallon basis, if the agency is a PaintCare partner. A few restrictions apply: there are limits on how much paint can be dropped off per visit. Also, note that certain businesses — those that produce more than 220 pounds (about 20-30 gallons) of hazardous waste per month — can only drop off latex paint (they may not drop off oil-based paint). When you decide it’s time to recycle your paint, please call your site ahead of time to confirm their hours and to make sure they have space to accept the amount of paint you would like to recycle. PaintCare sites accept house paint and primers, stains, sealers, and clear coatings (e.g., shellac and varnish), but we do not accept aerosols (spray cans), solvents, and products intended for industrial or non-architectural use. The products we accept are referred to as “PaintCare Products” or “architectural paint,” and they must be in containers that are no larger than 5 gallons in size. Paint must be in its original container and the container must have an original printed label and a secured lid. We cannot accept open or leaking cans. Please review the following detailed list to find out what can be accepted, prior to dropping off your paint. PaintCare’s program brochure is intended for the general public. To request free paper copies of this brochure for you or others, please contact us at 855-PAINT09. In addition to paint stores, real estate agents, property managers, and painting contractors, others are welcome to order brochures and distribute them to their customers. Professional painting contractors are one of the groups most affected by PaintCare. If you are a painting contractor, please review the information below to learn more about PaintCare, the fees, and paint recycling services available from PaintCare. It is expected that contractors will pass the fees on to their customers in order to recoup the fees they pay on the product. When estimating jobs, contractors should take these fees into account by checking with your suppliers to make sure the quotes for paint products include the fees. You should also let your customers know that you will be including these fees in your quotes. Retail drop-off sites provide a convenient and no cost recycling option for painting contractors and other businesses. Businesses that generate less than 220 pounds of hazardous waste* per month will be able to use these sites to recycle all program products (both water and oil-based) with some restrictions on quantities per month. Larger businesses (those that generate more than 220 pounds of hazardous waste per month) may use the drop-off sites for their water-based program products only; they are not able to use the sites for oil-based paint or other solvent-based products. *220 pounds is about 20-30 gallons of paint. When counting how much hazardous waste you generate in a month, oil-based paint counts (because by law it is a hazardous waste), but latex and other water-based paint does not count toward the 220 pound monthly total. If you have a large amount of unwanted paint, PaintCare offers a service that benefits both you and our volunteer drop-off sites — you don’t have to take your paint to a drop-off site a little at a time, and they don’t get overwhelmed with large volumes of paint. This free service is only available to households or businesses with at least 200 gallons of paint. To learn more, please review the following fact sheet. Then call PaintCare to request an appointment. Find out how the service works and how to request a pick-up. 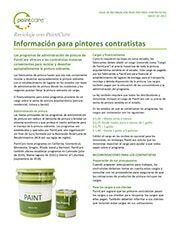 Information for painting contractors is available in English, Spanish, and Russian. Let your customers know that you are a paint drop-off location! Visit our Drop-Off Site Promotion Toolkit for artwork for digital advertising, social media, or print advertising. You can also order free point-of-sale (POS) materials or signage for your business or organization. Drop-Off Site Promotion Toolkit. Use these digital and print ad templates to promote your store as a PaintCare drop-off site on a website, in social media, or in a print newspaper or other publication. Not a drop-off site, but are interested in becoming one? Please see the information in the Partnering with PaintCare section at the bottom of this page. b. Sell Only Registered Brands: Retailers must make sure that they do not sell unregistered brands of architectural paint. Retailers can verify the registration of manufacturers and brands using the following lists which are updated regularly. If you are a retailer and do not see a manufacturer or brand of paint sold in your store on this list, please contact PaintCare at (855) 726-6809.
c. Provide public information about the paint stewardship program. PaintCare provides materials for retailers to use to meet this requirement and makes them available to all paint retailers for no charge. Brochures and other printed materials are available to retailers and facilities at no charge. Order additional materials online, or place an order by calling PaintCare at (855) 724-6809 or by sending a completed form by email, fax, or regular mail. Fact Sheet: Painting Contractors This fact sheet was developed at the request of retailers to help explain the program to their customers who are painting contractors. Some retailers have found it useful to send this to regular customers with monthly statements. Also available in Russian and Spanish. 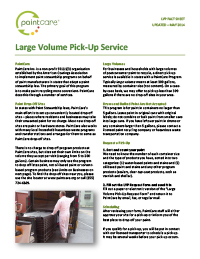 Fact Sheet: Large Volume Pick-Up Service This fact sheet explains PaintCare’s free pick-up service for those with at least 200 gallons of old paint. Also available in Spanish. General Poster for Retailers This poster is intended for use in stores in the paint department or near the cash registers to help explain the PaintCare program and Fees to customers. Also available in Spanish. Fact Sheet: Paint Retailers (General Program Information) This fact sheet is for all paint retailers in Oregon to inform them of their responsibilities under the paint stewardship program. Retailer Fact Sheet: PaintCare Fees Answers to common questions from retailers about fees. Fact Sheet: How to Become a Drop-Off Site. Explains the responsibilities for paint retailers that volunteer to take back leftover paint from the public. Retailers may volunteer to be a paint drop-off site and accept paint from households and certain businesses in their community. To learn more about what is involved in becoming a drop-off site, please read the above fact sheet. If you would like to be a drop-off site, please fill out our Online Retailer Interest Form, or use the Word or PDF version and send by email, fax or regular mail. Fact Sheet for HHW Programs. 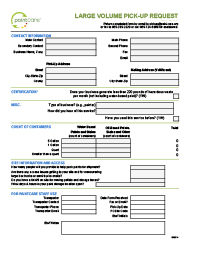 If you would like to partner with PaintCare, please fill out our Online HHW Interest Form (or use the Word or PDF version and send by email, fax or regular mail). Fact Sheet for Transfer Stations, Landfills and Recycling Centers. If you would like to partner with PaintCare, please fill out our Online Interest Form (or use the Word or PDF version and send by email, fax or regular mail). If you are already a PaintCare partner you can order PaintCare signs for your location, click here for a Sign Order Form. Municipalities that have contracts with PaintCare may request partial funding for pre-approved joint outreach activities with PaintCare to promote PaintCare drop-off sites and events. Past projects have included newspaper advertising, direct mail, and radio campaigns. For details, please read the following fact sheet. PaintCare encourages household hazardous waste programs, reuse stores and others to operate paint reuse programs (i.e., swap shops or exchanges). Reuse programs return good quality unused paint to the local community at low or no cost. Reuse is a preferred method of waste management. To encourage reuse, PaintCare will compensate paint drop-off sites operating a reuse program under a contract with PaintCare. PaintCare allows two different reporting methods by container or by volume as described here. At the request of HHW programs in PaintCare states, we developed suggested text and images on what to include when linking to PaintCare’s website. This one-page infographic (8.5″x11″) highlights the successes from the most recent reporting period for the Oregon PaintCare Program (January 1 to December 31, 2018). Please consider downloading and printing a copy of the infographic and then posting it for staff and the public at your business or organization. PaintCare prepares annual reports about the program for the 12 months ending December 31. In 2013 we prepared a six month report to allow for a change in the reporting period from a fiscal year to a calendar year. PaintCare has submitted two program plans for Oregon. The original, submitted April 2010, described the Oregon pilot program. The current plan is an updated version of the 2010 plan and has additional elements as required by the legislation in 2013 that made the program permanent. The plan for the permanent program was first submitted in January 2014 followed by a number of revisions. The plan was approved in March 2015. The Oregon program is a result of House Bill 3037 passed in 2009 and House Bill 2048 in 2013. The 2009 law established the program as a pilot program to start in 2010 with a sunset date in 2014; the program was made permanent by legislation in 2013. The Product Stewardship Institute (PSI) evaluated the effects of the PaintCare program on household hazardous waste (HHW) programs in five states that implemented paint stewardship prior to September 2014: California, Connecticut, Oregon, Rhode Island, and Vermont. This report summarizes PSI’s findings from the cross-state evaluation. At the request of the American Coatings Association and Metro Oregon, PSI evaluated performance of the first two years of the PaintCare program in Oregon. This report summarizes PSI’s findings. 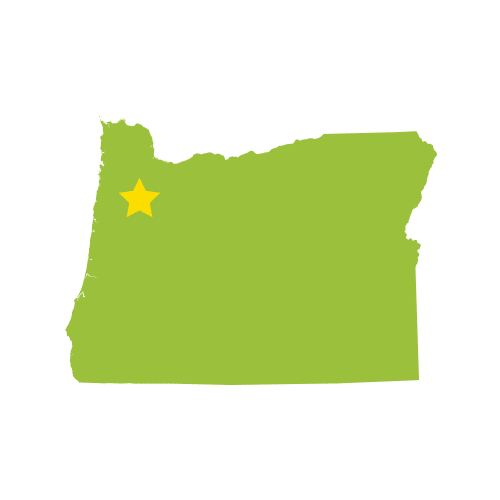 The oversight agency for the Oregon program is the Oregon Department of Environmental Quality (DEQ).